Back in July, my office hosted their annual potluck. I was blown away by the culinary talent that existed in an architecture firm. I tasted this potato salad that day, and knew I would have to recreate it when the time was right. Lobster BBQ was definitely the right time. 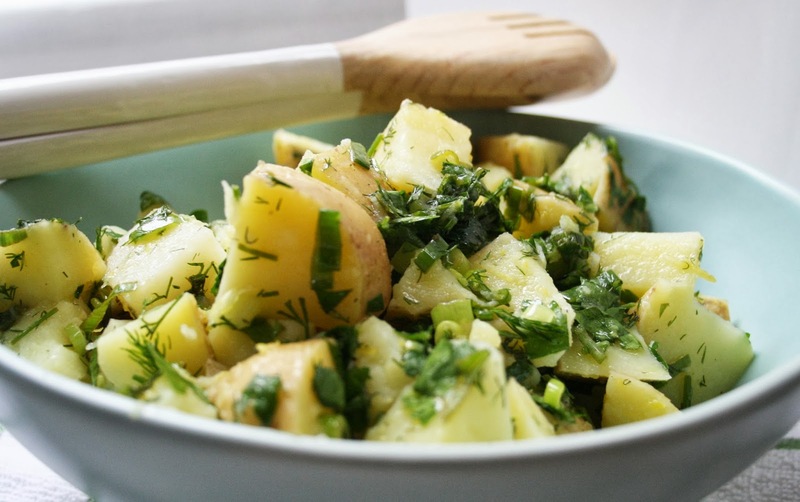 Cut the potatoes into chunks, put them in a large pot and cover with salted cold water. Bring to a boil over high heat, cover with a lid and remove from the heat. Leave the potatoes to sit, covered, for roughly 30 minutes. Mix the remaining ingredients all together in a bowl. Once the potatoes are cooked (test with a sharp knife - tender but not flaky), drain them, and add them to the herby mixture. Toss well, making sure to coat all the potatoes.